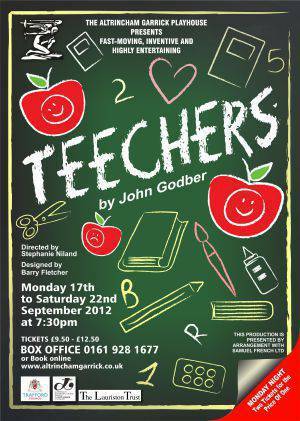 Fast-moving, inventive and highly entertaining, Teechers vigorously evokes life at a modern Comprehensive. Three fifth-formers, using the format of an end-of-term play, exuberantly sketch the new drama teacher’s progress through two terms of recalcitrant classes, cynical colleagues and obstructive caretakers until he departs, disillusioned, for the safe waters of a private school. The play runs the whole gamut of emotions, climaxing with the last scene when the teenagers’ despair emerges from beneath their youthful irreverence, giving a poignant edge to the comedy. Written for three actors to play some twenty characters. Teechers stretches the imagination of cast and audience alike. ALTRINCHAM Garrick's production of?Teechers?is so good it wouldn't be out of place on a professional stage. What's more, it made me look again at a piece I'd previously dismissed as not being vintage John Godber, and I left the theatre in no doubt that this is an exceptional piece of work. Yes, there are plenty of laughs as unruly pupils torment their teachers and experience the growing pains most of us endured and can now laugh at. But the play has a lot to say about the failings of the education system - for the privileged kids it is a land of opportunity. For many, it's a holding centre for young people who have already been written off by a society who doesn't know what to do with them. Hence Salty's strangely moving speech near the end of the play. Worry not - despite this comedy's more serious strands running through the play you never, at any point, feel like you're being preached to. In terms of the direction, Stephanie Niland has got everything just right and she more than gets the best out of Barry Spencer, Ros Greenwood and Laura Chandler. As well as playing pupils Salty, Gail and Hobby, they play numerous other roles, displaying a versatility that can only be described as astounding. 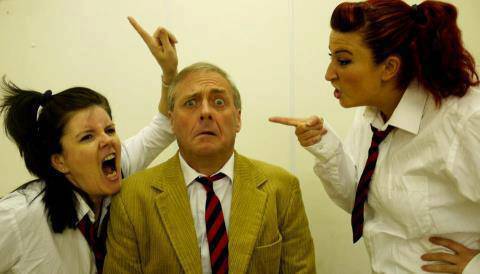 "Versatile Cast play 30 parts"
Three talented thespians display versatility and humour in John Godber's play, Teechers, performing 30 parts between them. The main character is Mr Nixon, a stars in his eyes drama teacher who quickly becomes disillusioned with the large comprehensive school where he works and eventually leaves for pastures new. He has to confront problems not only with pupils such as Oggy, the bully, but also staff. There is a nasty deputy head, an overwhelming headmistress and a bad-tempered caretaker. The actors, Laura Chandler, Ros Greenwood and Barry Spencer also play school respectively, school leavers Hobby, Gail, and Salty. The three manage to give a hilarious version of Romeo and Juliet in about three minutes and the scene featuring the Christmas dance and Gail flirting in Mr Nixon's car also gets a lot of laughs. It's a miracle how by small changes of clothing the cast make each of their characters so easily identifiable and different. The feel of the 1980s is conveyed by pop music of the time and other give-aways such as smoking by teachers and pupils alike. Popular playwright and BAFTA winner John Godber uses a rundown comprehensive school as the setting for ?Teechers?, similar to his earlier and more well-known play: ?Bouncers? this also relies on multiple characterisations from a small cast. It was clear that first time director Stephanie Niland had the vision of this play firmly in place and with the assistance of a dream cast was able to express her vision with stunning results. I imagine many directors would run a mile from this piece as this is a play which stands or falls on the amount of energy, passion and enthusiasm injected into it from its director. This was a drilled, inspiring and no less than a professional quality performance! First-class and diverse acting ability was on display, the standard within this production was overwhelming as we witnessed the highly energetic and talented cast of just three take on the immense twenty roles between them. The focus and capability of The ?Teecher? trio alone was astounding. Laura Chandler is fire on stage, she oozes charisma and delivered an exceptional performance with such direct energy, my favourites amongst many of her wonderful interpretations was as the cocky full-of-himself bully which contrasted - making the opposites of her characters even more hilarious ? with the head of drama / am dram enthusiast ?luvvy? putting on the Mikado. Ros Greenwood gave an incredibly expressive performance with facial expressions to rival Jim Carey, her portrayal as the caretaker was on the verge of genius - again - beautifully contrasting with the seductive gym coach. Finally, Barry Spencer gave both slapstick and warmth in his renditions, I?ve seen Barry in a few plays now and I?m in awe how he can translate exactly what he?s thinking in an instant, a very likable character on stage. If anything was to let this production down slightly I would have to say that more attention could have been given to the technical side, the stage was not always lit to the best effect and sound cut offs were a tad harsh but this by no means put a damper on the production for me. Many congratulations on such an inspiring and exciting production!